America’s greatest living philosopher is no more. He died yesterday at the age of 90. Berra was an All-Star for 15 seasons, and was selected to 18 All-Star Games (MLB held two All-Star Games in 1959 through 1962). He won the American League (AL) MVP award in 1951, 1954, and 1955; Berra never finished lower than fourth in the MVP voting from 1950 to 1957. He received MVP votes in fifteen consecutive seasons, tied with Barry Bonds and second only to Hank Aaron‘s nineteen straight seasons with MVP support. From 1949 to 1955, on a team filled with stars such as Mickey Mantle and Joe DiMaggio, it was Berra who led the Yankees in RBI for seven consecutive seasons. The photograph below is one of those iconic images that anyone hoping for a career as a sports photographer—or maybe even a career as a photographer, period—ought to recognize. 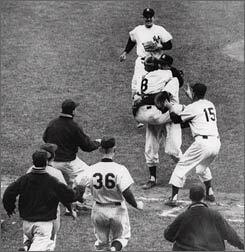 Berra’s exuberance was the cherry on top of pitcher Don Larsen’s perfect 1956 World Series game. But all that was before my time. Yogi Berra the philosopher was the man I knew best. I became aware of Berra because of his Will Rogers-like commentary on life. His one-liners were both humorous and absolutely on target. I’ve always loved things that appear to be simple but are actually complex. Berra’s remarks—such offhand and seemingly befuddled tautologies—capture both a commonsense, everyday truth and an existential, timeless TRUTH amplified by insights derived from the playful irony of his verbal acrobatics juxtaposed against our thwarted linguistic expectations. A lot of guys go, ‘Hey, Yogi, say a Yogi-ism.’ I tell ’em, ‘I don’t know any.’ They want me to make one up. I don’t make ’em up. I don’t even know when I say it. They’re the truth. And it is the truth. I don’t know. A true “yogi” in the Hindu tradition is self-aware, so maybe Berra didn’t fit the bill that way. But in terms of enlightenment, Berra stands alone in representing something essentially American. We are largely a practical people, preferring “populist” action and physicality to elitist intellectualism. Yogi somehow managed to be both an ordinary “everyman” and a philosopher whose humor prompted reflection about the eternal truths running beneath the surface of daily reality. Our messy lives—as endured day in and day out—are far more meaningful than the constant natter of job noise and family chaos might otherwise imply. This entry was posted in Life, News, Popular culture and tagged American philosopher, aphorisms, baseball, enlightenment, sports, Yogi Berra, Yogi-isms. Bookmark the permalink. 1 Response to He came to the fork in the road . . . and took it. RIP, Yogi Berra.